Stormy weather - which brought a tree down over part of the road on Lisburn's Harmony Hill (near the Clonmore Manor entrance). 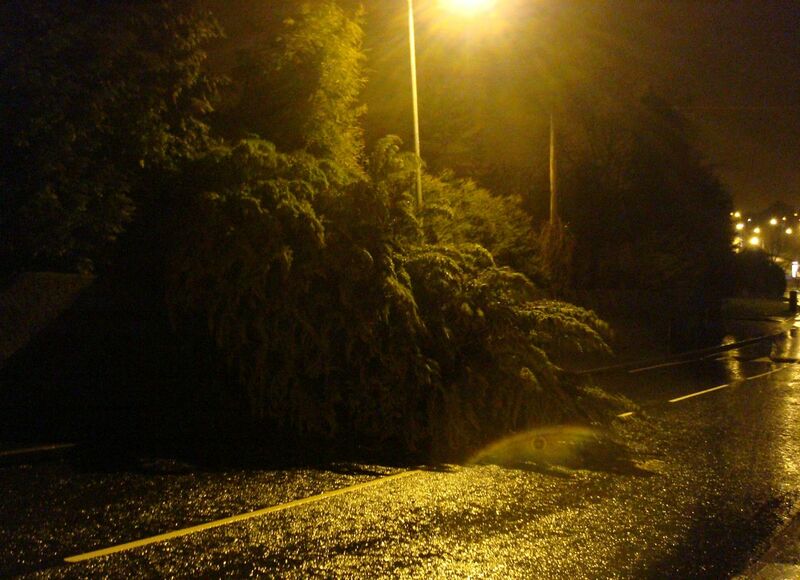 Roads Service say that the tree surgeon is aware ... I think he's having a busy night! This morning was one of those unusual mornings. Normally science fiction is an afternoon or evening pursuit. But today, I was along at the QFT by 9.30am for the preview screening of the first episode of Doctor Who featuring the eleventh Doctor Matt Smith. 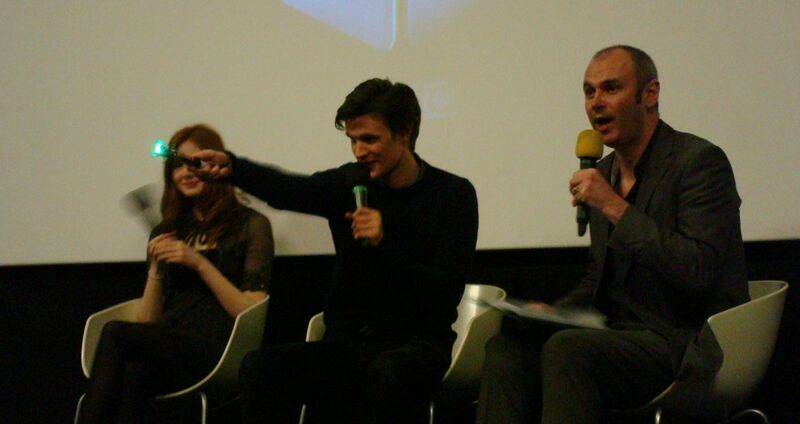 Karen Gillan (who plays his new companion Amy Pond) was there too, signing autographs, and answering questions for the invited audience of school children from across Northern Ireland as well as [cough] some hangers on. I’ll not spoil Saturday night’s episode for you with any new plot points. The previous programme finished with the Doctor still recovering from the regeneration process and the TARDIS spinning out of control. And that’s where The Eleventh Hour begins. Projected onto the QFT’s main screen, the HD quality picture was obvious and gorgeous. Early on there are comedic moments with a great Murray Gold score pressed right up against the dark plot. There’s lots of sonic screwdrivering, plenty of “twenty minutes to save the world” – that’s not a spoiler, it happens every couple of episodes! – a quick cameo from Patrick Moore, and a bit of talking on a mobile phone while driving a stolen emergency vehicle. But expect to wait a while before seeing inside the retro-generated TARDIS. I reckon Amy Pond will make a great companion. Feisty and capable of pulling the Doctor along, and only an inch or so shorter, she looks like she was destined to travel in the blue police box along with the mad, impetuous Doctor who is still figuring out what his new self is like. This morning’s crowd loved Steven Moffat’s new creation. I couldn’t find anyone with a bad word to say about it. I was primarily there with my Audience Council hat on – something I normally keep separate from this blog – but since the Doctor Who tour team seemed comfortable, I grabbed a couple of voxpops with some of the older children adults immediately after the Q&A session that followed the screening. Tomorrow the Doctor Who tour hits Karen’s home town of Inverness before swinging south through Sunderland, Salford and Northampton (Matt Smith’s home town) during the rest of the week. So having vegged out on The Boat Race on Saturday afternoon, why not settle down on – or behind – your sofa with a bowl of custard and some fish fingers and watch the new Doctor and his companion in action. Saturday 3 April, BBC One at 6.20pm. I’ll be tuned in to see the bits missing from this morning’s preview - including the lead into the second episode. 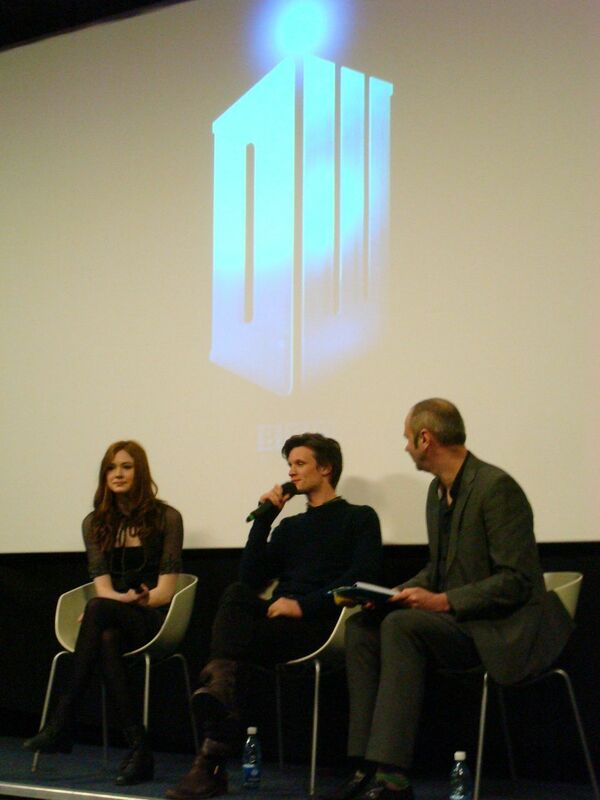 Update - you can catch BBC Newsline's interview and other details from the day on the Doctor Who news page. 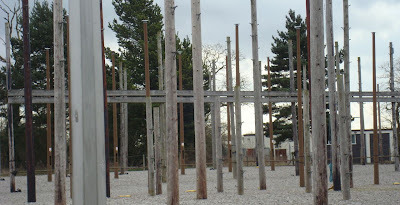 I like to pretend that they grow telegraph poles in this magic yard. Every night they shoot up an inch before eventually being harvested and taken away to be used somewhere else in the country. 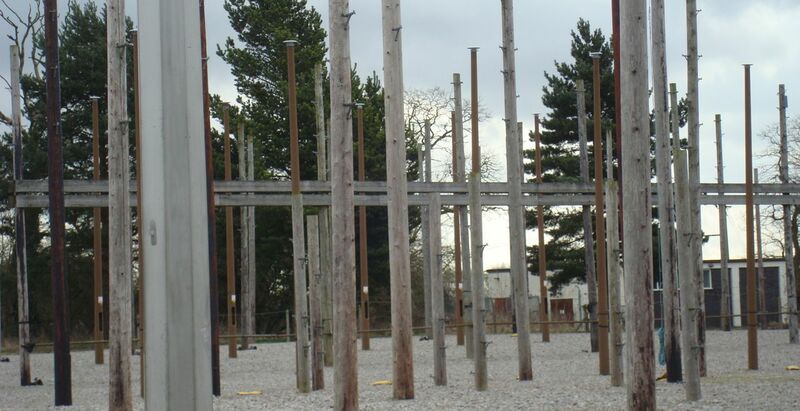 Unfortunately, the reality is less exciting - it's a training facility! Blogging has been a bit light this week as I've been away being on a course, being indoctrinated into the ways of the TOGAF enterprise architecture framework. I'm not looking forward to the exam! Filming of the second series of children's programme Sesame Tree is underway in Northern Ireland, and a new cast member has just been announced by Sesame Workshop and the local production company Sixteen South. 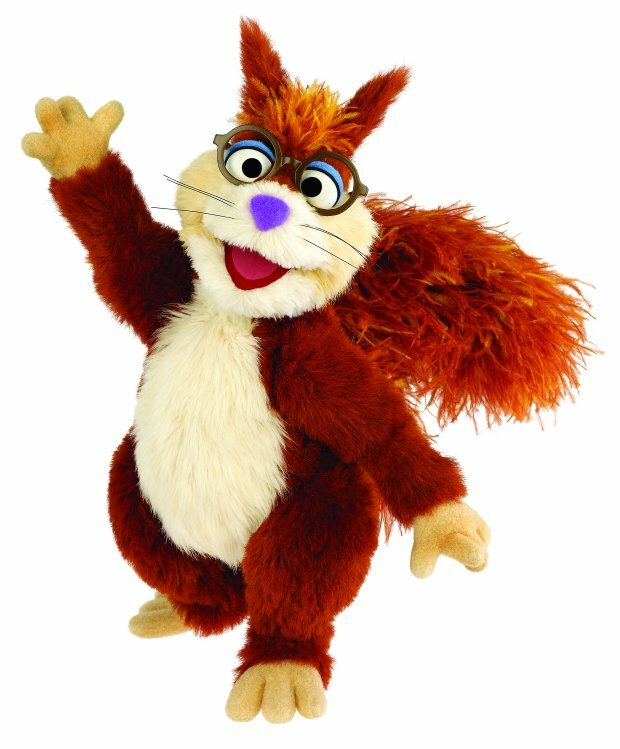 Joining the main two stars from the first series - Potto and Hilda (pictured below) - with their unbashfully broad accents is a young squirrel muppet called Archie (short for Archimedes). He'll be the one with the bushy tail, glasses and the catchphrase of "Sweetily deet". "He is truly delighted to be friends with Potto and Hilda and loves the fact that every day in the Sesame Tree is filled with laughter, singing, learning and lots of silliness." Quite likely that local puppeteer Mike Smith shares this view with his character Archie! In the second series of Sesame Tree, we'll see Archie out and about with Hilda, as his friends "encourage him to be less afraid if he’s frightened of something – or help him to prepare for a new challenge". It'll be "beezer" to see Sesame Tree back on Cbeebies at the end of 2010. 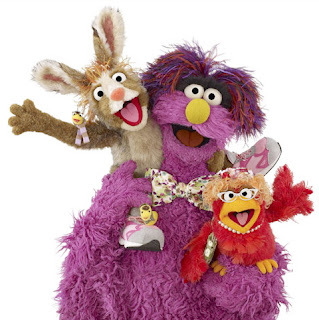 Sesame Tree promotes messages of respect and understanding through engaging educational content that encourages children to explore and appreciate the world around them. We live in an impatient Martini society in which many of us demand instant gratification and one-click ordering and delivery of all our material wants. Picture the scene. You've come out of the house without your internet-ready smart phone and you call into your local book store - assuming it's still in business - but it doesn't have the title you're looking for. No problem. Look no further than the Espresso Book Machine sitting in the corner of the store. The good folks at On Demand Books are marketing an instant publishing solution that prints, binds and trims a book while you wait. h/t Future Perfect Publishing blog. With the Belfast Film Festival coming up in April, cinema is on my radar. A recent email to me highlighted a local film that appeared in last year’s festival line-up and is now being screened in the Queens Film Theatre from Saturday 20 to Thursday 25 March. Ditching is the debut feature film from Factotum, the Belfast-based arts group possibly better known as the publishers of The Vacuum. (Their new Bureaucracy issue is out now.) 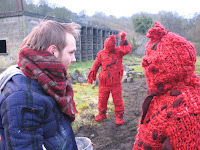 They were also selected to participate in Northern Ireland’s first showing at the Venice Biennale. And they have a choir too! Northern Ireland, the future: in a post-apocalyptic landscape of decaying towns and primitive technology two people set out on a journey in search of medicine. Ulster has become a depopulated, feudal and dangerous wilderness where its inhabitants have forgotten the past and are confused about the ruins that surround them. They distract themselves with improvised ceremonies and games but feel threatened by a world they do not understand. Along the way the travellers find themselves embroiled in a number of situations involving a cast of unpredictable characters including a wise hermit, a tribe of cannibals, a dysfunctional army and an entrepreneurial priestess. What fate will await them at the end of their journey? The film stars local acting talent - including Lalor Roddy (Hunger), Jonathan Harden (Fifty Dead Men Walking), Juliet Crawford (Five Minutes of Heaven), Paul Garret (Cherrybomb) and Mary Lindsay – and an original soundtrack. I’m intrigued by the sound of this film, though I’ll be out of the country so won’t be able to make it along to a screening. But if you make it along to the QFT, come back and comment below about the film and how you found it. Update - August 2010 - posted a review of Ditching. I've been a fan of the Twelve Five's website where Iain Anderson occasionally posts minute-long videos - twelve shots, five seconds each. While not as beautiful and well crafted as Iain's output, here's the Belfast St Patrick's Day parade as a Twelve Fives. "I think it's an opportunity for both communities to come together to do something constructive that really promotes Northern Ireland." Not so hopeful to hear the drunken lads shouting IRA chants at the top of their voices on Fountain Street and saying they were "goin' to the Holylands to start it off". Each week's Radio 4 Choice podcast is like dipping your hand into a goodie bag and pulling out a prize. This week's gem was an unusual documentary about Belfast by artist Bill Drummond. It's still available to download for another couple of days. At times it feels like Drummond lives in an alternative universe, describing a different city than the Belfast we know. (As a man who burnt a million pounds and called it art, this may be the proof that he does indeed live in an alternative universe!) Yet it's full of wit and made me smile on the drive home last night after a very long day. "When artist Bill Drummond discovered Belfast wasn't twinned with anywhere he made a sign and put it up under the city's welcome notice. It said 'Belfast: Twinned with Your Wildest Dreams'. In this programme, Bill shares his vision of the city: his memories of glamorous 1930s cinemas with glittering curtains, of spontaneous creative happenings and a landscape where the smell of the mountain heather seeps down to the city centre. With a range of urban guides, Bill offers a tour of Belfast unlike any you've heard before." On the ArtsExtra blog last month, Marie-Louise Muir described her night out with Drummond which you'll hear near the end of the programme. Over on Slugger, Mark has been musing on the subject of how a legitimate political state is defined (Congress of Vienna, the Montevideo convention, recognition by the UN and social theory) and how this is reflected in the arguments put forward by those who reject the legitimacy of Northern Ireland (usually referring to it as the Six Counties). I intend leaving that conversation over on Slugger where it will run long and heated! But on a related note, the Electoral Commission recently updated their Code of Practice for Electoral Observers. 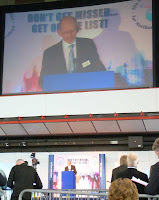 Long time readers will remember that I signed up as an observer before last June’s European Election and posted a bit about some of what I saw during the opening of postal ballots, polling day, the verification and the count. The introduction of the legislation that supports Electoral Observers was delayed in Northern Ireland until 2009. Though with the level of interest in politics and polls, it was no surprise that there were proportionally (and probably numerically) more observers registered in NI than anywhere else in the UK. The Code of Practice has to be signed by observers, committing them to maintain political impartiality, observe the ballot secrecy requirements (ie, never reveal an individual’s vote), avoid obstructing the election process, make accurate observations, etc. Which all serves as a reminder that if you’re interesting in being able to observe democracy in action – perhaps at the upcoming General Election – and are keen to form part of the process of electoral accountability, then you’ll find more information about signing up on the Electoral Commission website. With the change to the rules, there’s even less standing your way! The Belfast Film Festival has recently launched this year’s programme. Worth checking out. One of the films I attended last year included snippets from the Lives of Spaces exhibition that eight Irish architects staged at the Venice Biennale in 2008. The exhibition is now on show in Ormeau Baths Gallery – on Ormeau Avenue, just up from the Holiday Inn. Today at lunchtime, one of the architects involved, Niall McCullough, gave a talk about his piece. He sees a blurring of the boundaries between disciplines. Architecture and music have long been connected. But increasingly, artists are making structures and buildings that used to be the preserve of architects. Architectural photographs are nearly always devoid of people, lest they spoil the clean lines of the empty building. Taken early in the morning, with strong light, and stray furniture moved out of the way, the photographs document the new building before the owners and the consumers make their mark. So for their exhibit, they contrasted shots of an empty building – Waterford City Library, which McCullough Mulvin architectural practice had worked on five years previously – with moving images of it in use. Eight different vistas were filmed and play alongside a filmic version of the original architectural photographs. As well as the library users, two static figures dressed in black were placed in each shot. Maybe like figures in a renaissance painting, they represent the architects? Maybe they point to the next view. Maybe the tall lady and the short man are looking for each other? Maybe they’re in love? The viewer gets to decide. McCullough pointed out that it was unusual for him as an architect to return to a building once it was in use. By having to sit in the library to think about the project, he’d discovered and come to terms with elements of his design that had worked, and elements that had been less successful. In the age of the internet, people still go to libraries and find them to be “value free public spaces” where no one asks you why you’re there, you just go and do your own thing. You’ll catch the full Lives of Spaces exhibition in the Ormeau Baths Gallery until 27 March. Lives and Spaces: Art, Architecture and the Public symposium on Thursday 25 March looking “at how art, architecture and curating intersect in the public realm, through exhibitions, public art and the built environment”. In conjunction with OBG and PLACE. A workshop on Buildings of the World suitable for 8-10 year olds running on Saturday 13 March from 10.30am to 12.30pm. Lastly, at 7pm and 9pm on 23-25 March, members of the Lyric Studio (Lyric Theatre’s professional training programme for 18-24 year olds) will perform their original piece based around themes and visuals from, and responses to the exhibition. Places are limited – so contact Ormeau Baths Gallery in advance. In the land of the over-governed, the Chief Electoral Officer is king? Well, they’re looking for a new one! Douglas Bain retires this year and the hunt for his replacement has started. If you fancy your chances organising and robustly defending Electoral Office NI’s activities, voter registration, management of polling stations and counts, and you have the mandatory experience, the NIO would like to hear from you before the closing date of 9 April! a minimum of 3 years senior management experience of leading a team and working with a diverse range of internal and external stakeholders to deliver agreed outcomes, involving partnership working. And with on average an election every year, and the NIO handing over much of its interest in elections to EONI once Policing and Justice finally devolved, your life will never be dull. Castlereagh Council to go public! It seems that Castlereagh Borough Council, some of whose members are normally so reluctant to make meetings and minutes public, are about to join the vast majority of other local councils in Northern Ireland and start to publish their minutes online. This morning’s Belfast Telegraph brought the news that Castlereagh’s full council meeting in February approved the decision by its Central Services Committee to start “to publish minutes from all council meetings on its website from this week”. They’ll finally be bringing their practice in line with the advice from the Information Commissioner’s Office. The paper's article noted that “Castlereagh Council will back date minutes on its website for the current electoral term, making them available from 2005”. Castlereagh’s website only merited a single star in the recent Socitm Insight survey of council websites. Belfast City Council was awarded three stars; Coleraine Borough Council picked up two stars. But of the 24 local councils in NI that scored one star, Socitm rated Castlereagh’s website joint bottom. Their team of reviewers pointed to a “lack of customer focussed content” and that “it would be good to … have some online forms etc”. They “couldn't find an events calendar or councillor's allowances/expenses”. But perhaps most importantly, “No search facility found” … “Add a search facility”. Even with the addition of online minutes, Castlereagh may have some distance to go to get off the bottom of the table in next year’s survey. Local blogger Destroy All Onions pointed out to me yesterday that Doctor Who is coming to town. As part of the publicity and excitement being generated around the new series, the TARDIS (well, a bus bearing the Doctor Who logo and carrying the new Doctor and his companion) will be materialising in Belfast on Monday 29 March. BBC Outreach is organising the tour of five UK venues and has the remit of taking the BBC into communities and sections of society that are relatively underserved by the BBC. The Doctor Who bus will be touring through Belfast, Inverness (home town of Karen Gillan who plays the new assistant Amy Pond), Sunderland, Salford and Northampton (Matt Smith’s home town). There will be a regional première of the first episode at each venue, along with a chance to see the Doctor Who trailer in 3D. Children (small and big perhaps) can meet Matt and Karen - the Doctor and Amy - as well as some of the Doctor Who monsters, and “get their photo taken tumbling through the giant vortex”. Update - quick review of the preview and my impressions of the first episode. 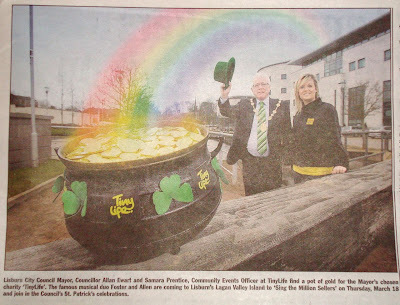 As I flicked through last week's Lisburn Echo freesheet, this picture jumped out at me! ... though do try and keep your suggestions suitable for a family audience. If I’m honest, I wondered if I was wise heading down to Dublin very early on Saturday morning to get to the RDS and the Sinn Féin Ard Fheis. In the end, having attended the majority of the other local party conferences (only missed the DUP and the Greens ... and the TUV), my curiosity and people’s prompting got the better of me, and I drove down into a world and a party that I’m largely unfamiliar with. Like the other posts about party conferences, I’m covering how it happened and what was said; I’ll leave the political analysis to others. Like me – until recently – most people reading this blog probably haven’t been to a party conference, and certainly not one run by Sinn Féin . The Ard Fheis had the same family feel of other large party conferences. Friends with similar outlooks and common interests meeting up. There’s a huge social aspect on top of the actual conference business and party grandstanding on TV. When it comes to logistics, Sinn Féin are very well organised. I’ve seen their planning and management first hand as an Election Observer back in June at the European poll. And those skills were on show again yesterday. A big set filled one end of the conference hall with two rows of party luminaries high up on the raised stage behind the main podium. Morecambe and Wise could have had fun with the bank of steps in front. Though one speaker pointed out that the set wouldn’t be accessible for many disabled speakers and hoped there would be improvements next year. Despite the multiple manned camera positions around the hall, there wasn’t a screen embedded into the set to magnify the head of the speakers. And no distracting Powerpoint visuals! Just words. I’d expected tricolours galore, but a single flag stood at one side of the stage. Most parties rely on their venue’s wireless hotspots to serve the media and bloggers. Sinn Féin provided wired internet access, extension sockets and even direct audio feeds for anyone who needed them, as enough seats and tables to cope with the expected masses. There was encouragement from the front that speakers should not waste time repeating back what they said in Irish/English in Irish/English as wireless simultaneous translation headphones was available and both languages were equally valid for use. 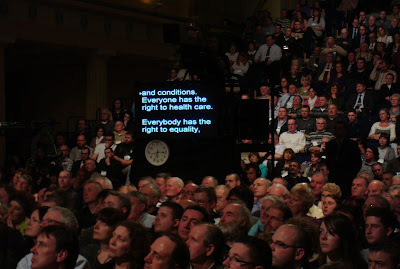 The RDS hall holds about 600 people, and it was full during the “live” sessions that went out on RTE and BBC; at least half full for the rest of the day. Despite the number of delegates, the exhibition space was sparse. If it hadn’t been for the repeated use of the word “comrade” I could have closed my eyes and imagined that I was back at the SDLP conference. There was a similar volume of motions: Sinn Féin covered 152 compared to the SDLP’s 172. How come the unionists get by without all these official policies? Lots of topics that you’d expect a democratic socialist party to cover: turf cutting versus peat extraction; perinatal services; student housing in the Holylands and the potential for a similar “erosion” in North Belfast as the University of Ulster expands its Belfast campus; objection against the plans for extension of the Belfast City Airport runway; and a mention for Titanic Quarter with a call for the Executive to intervene to ensure “maximum benefit for working class communities in terms of social housing, employment and community involvement”. Sinn Féin deal with the motions in blocks of up to thirty. A queue forms at the side of the stage for delegates wanting to speak for or against one or more of the motions. The speeches are time limited, and once the time allotted for the motions is over, no matter who is left in the queue the session closes and they move straight to the votes. Compared to the SDLP experience of poor timekeeping and continual slippage in the timetable of business, they should send someone along to observe at the next Ard Fheis to pick up tips! Despite being an all-island party and trying to keep policies equally applicable across with NI and the Republic, there’s a fair amount of context switching between the 6 counties and the 26 counties. So in amongst the motions to reaffirm support for Education Minister Caitríona Ruane there was another centrally-proposed motion “opposing the Irish Government’s withdrawal of the support services grant from Protestant fee-charging schools in the South”. I was surprised at the level of debate and the occasional distension. Not at all the tightly controlled, always on-message party conference I expected. During one of the early sessions on Saturday morning, a delegate was openly critical about the party’s lack of progress around a donor card resolution passed at an Ard Fheis a number of years ago. It was a quiet year in terms of significant motions and business. NI journalists said that the weekend’s real political news story was happening up north with the UUP gearing up to throw a spanner in the works of Policing & Justice and in County Tyrone with the meeting of the Orange Order’s Grand Lodge that ended up giving a “cautious welcome” to the report of the joint committee on parades. 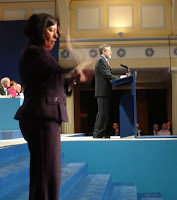 The high emotion and drama of previous Ard Fheiseanna (plural of Ard Fheis) that voted on the Good Friday Agreement and other peace process issues was missing, and “there's less of a whiff of cordite about this conference than those fifteen years ago” as Mark Devenport succinctly posted on his blog. During the hour-long televised sessions, I was nearly breathless watching the quick succession of speakers getting up on stage to deliver their four minute message to camera as soon as the applause for the previous speaker faded. The order of speakers, their subjects and their content was no accident. Mary Lou McDonald and Martin McGuinness followed by three southern councillors (including Thérèse Ruane, Caitríona’s young sister). Then it switched to the north with contributions from local MLAs just in time for the BBC coverage to pick up. If it had been Britain’s Got Talent the Oscars, then Noleen Mc Polin would have stormed away with the best newcomer award for her spirited performance, backing Ruane’s education plans and stating that “[educational reform] will be the most radical delivery of the Executive”. If she doesn’t end up on a district council or standing as MLA for South Down in the 2011 Assembly elections, I’ll eat my hat … or sit through another party conference! By my counting that means that there have been more north/south ministerial level meetings that Executive meetings! Michelle Gildernew presented the Farming News. As well as outlining her department’s programme to tackle rural poverty and social exclusion, she explained “why I am targeting the next £7 million tranche of our farm modernisation scheme at those farms and farm families” “who live in the more difficult environments, on our hillsides and mountainous areas”. Expect an Equality Impact Assessment on that policy soon. Alex Maskey was next with Crimewatch – “We believe we are making good and steady progress as the Policing Board and DPPs engage more with communities” … “Comrades, we are delivering on our mandate while striving for an all-Ireland justice system”. I was surprised that unlike policing and justice speeches at other party conferences, Maskey made no reference to Peadar Heffron. Update - On the Friday night, Sinn Féin’s national chairman Declan Kearny did speak out against dissident violence and mentioned his cousin Peadar Heffron who “is making a good recovery and hopefully that will continue to be the case”. But Maskey still missed the opportunity. Caitríona Ruane’s speech was well reported in the media and said lots of predictable stuff about her education policies and pointed to investment in schools … while making no reference to the fact that there is no budget available for building and repair work on NI schools after 31 March – which has forced the curtailment of some projects underway. Speakers from movements in Palestine, the Basque Country and South Africa had a chance to address the delegates after lunch. Gerry Adams took his place on stage for the first time on Saturday during this session. The gentleman from Palestine declared “I adore your people, love the Sinn Féin and it’s democratically chosen leaders, and I particularly love my friend Gerry Adams”. Conference was brought a message from a Basque compatriot in jail and finished with a crowd pleasing “Tiocfaidh ár lá”. Lastly, Baleka Mbete, the national chairperson of the ANC took to the stage. She was impressed with how Martin McGuinness had cleaned up, wearing shirt and tie, and doing important meetings. She recalled Northern Ireland politicians coming to South Africa, but having to travel in separate planes, eat in separate restaurants. But Nelson Mandela came and scolded them and it seemed to have worked. No surprise that this bit was left out of the Sinn Féin press office’s summary note of her address! She hoped that Mandela will “stick around” to enjoy the World Cup, and the ANC centenary in Jan 2012. Compared to the SDLP and Alliance conferences, Sinn Féin had a much older audience with fewer young people in attendance. Fashion wise, there was a lot more denim being worn than the other party conferences; but the SDLP’s short skirt trend didn’t really extend to the Ard Fheis! Other than the international guests and some self-tanning disasters, the Ard Fheis delegates were all nearly as pasty faced as me. Where was the diversity that is so obvious across the island? Put bluntly, the Progressive Unionist Party’s conference had more black delegates, despite being tiny in comparison with Sinn Féin’s Ard Fheis. Plenty of talk from the platform about standing up for LGBT rights, but a lack of ethnic diversity and physical disability. I called in at the youth fringe event organise by Ógra Shinn Féin over tea time. About 45 young people listened to a panel talking about how “to make this country a better place for ourselves”. Panellists described how they got into politics, their desire for a unification and thinking about the inequalities of society. As well as an honest reflection that standing for council had made one guy very recognisable in the pub, the youthful delegates were encouraged to get onto sites “like Facebook and Twitter and put up the events you’ll be attending, the rallies and protests” to get the word out about OSF activities. One northern panellist who was a local councillor talked about his experience of “working with unionists when we can, and only confronting them when necessary”. This reflected other comments from the main stage on Saturday – practical co-operation rather than mindless aggravation. He also pointed out that unionist voters were consistently contacting Sinn Féin advice centres for help – echoing Niall Ó Donnghaile’s experience described in a previous post. While the BBC generally broadcast from the party conferences at lunchtime, the other southern party leaders prefer going live to the nation on RTE at half eight on Saturday night. The Ard Fheis was elongated this year to accommodate Gerry Adams speaking at half eight. I’d been warned that the hall would fill up and that there would be an influx of journalists coming in at the last minute to cover his speech. While the hall was packed with delegates, the media throng was overstated. Security was very visible all day. But I’m still not sure why – minutes before Adams came back into the hall to deliver his speech – we were told to note the location of the nearest fire escape? Suddenly for the a sign language interpreter (presumably ISL, rather than BSL) appeared to the side of the stage – the first time all day. I can’t help feeling she was there for the cameras rather than anyone in the audience. The shadow of the Ryan Report, the Dublin Archdiocese Commission’s investigations, and Liam Adams was clearly visible in the extended section dealt with children. It doesn’t say unless you are poor or elderly, Or unless you have autism; or learning difficulties; or disabilities. Or unless you come from a remote rural area. Or from Moyross or Sheriff Street; or Strabane or Ballymena. There was a call for people to stop being passive and get stuck in. Not sure if that means there will be an upsurge in republican bloggers?! The theme returned again later in the speech. Think I’d prefer if parties reversed the order and stood up for others before themselves, but maybe that’s why I’m not a member of any. The economy was never far away from speakers’ lips on Saturday. Adams took a few shots at the government and at NAMA. As the 25 minute speech concluded, members of the public Northern Ireland were invited to come to Sinn Féin “town hall” meetings and help crowdsource their “manifest for change”. And a quick mention of the continued strategy “to marshal [the Irish diaspora’s] political strength in support of a United Ireland”. The speech ended with the second “Tiocfaidh ár lá” of the day followed by a sharp militaristic ninety degree turn to the right, stand to attention and a song. Willie McCrea doesn’t have the monopoly on culture! I grew up during the Troubles. I remember sitting (reading) in the back of the car on the way down to a holiday in West Port. Black flags lined the lamp posts for much of the journey. I remember listening over breakfast to the daily account of overnight violence, bombings and murders on Good Morning Ulster. I wish Sean Crummey had been around to do the voiceovers for Gerry Adams on television reports. Culturally, I can’t help but associate the republican movement with those dark days. The organisers and delegates were a friendly and welcoming bunch. There were none of the suspicious looks or pointed questions that a naïve blogger might ave expected. 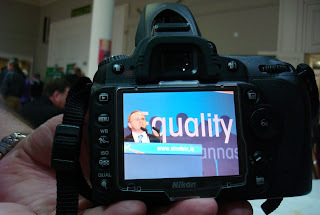 The Ard Fheis was a party conference like many of the others I’ve witnessed over the last few months. They debated the minutiae of turf cutting one minute, criticised the government and other parties the next. They took advantage of the rare, unedited access to television and online audiences, as well as well as conducting vital party business to keep the party organisation on the road. There was a lot of back-slapping, and not too much back-stabbing. Heaps of advice doled out to other parties, and plenty of encouragement for the most often criticised representatives and policies of their own party. Humour in abundance – Barry McElduff is still Sinn Féin’s version of Sammy Wilson (DUP) or Basil McCrea (UUP). And not a mention of guns or bullets, prisoners’ rights. Don’t think I even caught a reference to Iris Robinson. She must have been on the banned topics list. 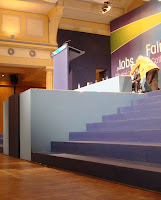 Mary Lou McDonald spent quite a lot of time in the hall, sitting up on the stage during the business. But Gerry Adams and Martin McGuinness were much less visible. Admittedly, they were busy giving interviews and serving the demands of the multiple media outlets present. But they had a lot less face time with delegates than the leaders I could see at other party conferences. Sinn Féin have left the building and won’t be back to the RDS for a few years. Future Ard Fheiseanna will tour the four provinces of Ireland over coming years. 2011 will see them in Belfast – possibly returning to the Ulster Hall (not the first time it’s been held there) if the clash of dates with the Waterfront Hall can’t be resolved. Only Our Rivers Run Free? No, not the miniature hurling sticks commemorating republic heroes, nor the Bloody Sunday DVDs (the James Nesbitt version! ), nor the “Drawing Support” guide for budding mural painters. 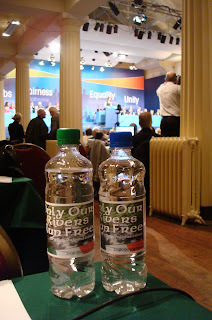 But instead, the “Only Our Rivers Run Free” branded bottled water – still and sparkling – that was selling for €1 throughout the conference. “For a taste of a United Ireland” claimed the strapline on the bottles from Carrickmacross, County Monaghan. The hint of cloudiness might have been my imagination. 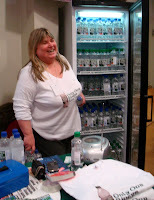 Though the free RDS tap water tasted just as good as the chilled bottles. Pity there weren’t any recycling bins to ease the environmental impact of all the bottles sold and emptied in the hot conference room! And I expect most workplaces would ban the bottles under flags and emblems policies! Ewan McIntosh - who used to be in the 4iP parish - had a great post last week on libraries. Perhaps it's relevant to the Libraries NI consultation on library provision in Greater Belfast. DPP websites still offline ... invisible policing partnerships? The continued unavailability of the District Policing Partnership websites is perhaps another example of the difficulties that public sector IT projects can face. Back in August 2009 the old sites were already frozen and couldn’t be updated by local DPP managers. By September the local DPP sites had been taken offline and replaced with a simple holding page. By November, the holding page was finally updated to include contact details for the 26 local DPPs. Socitm have published their Better Connected 2010 report looking at council websites across the UK. Only eleven councils (3%) across the UK came out with the maximum four stars. In general, Northern Ireland’s 26 councils didn’t fare well. There are some extenuating circumstances. Some of the six specific topics that the report assessed and rated as important (jobs, library services, schools, family history, planning, rubbish collection) fall outside the remit of NI’s councils. So while rubbish collection is in scope, library services and schools are dealt with by the remnant Education & Library Boards and the relatively new Northern Ireland Library Authority. However the thrust of the Socitm research remains valid. Well done to Belfast. I wonder will any of the other councils publish the comments made about their lesser-rated websites along with their proposals for improving how they serve local ratepayers? Drum roll ... the full results for NI’s 26 councils from Socitm Insight. I’ve noted the areas which the specific areas and themes that the report highlighted as being good. It has got to be a wake up call for Northern Ireland's councils as they prepare to shuffle down from 26 to 11 larger council blocks if this element of the Reform of Public Administration goes ahead. In an age of technical improvement, shrinking budgets and a move to self-service, council processes have still a long way to go. Update - You can use Pezholio's mashup to get a feel for the spread of council website performance across the UK.